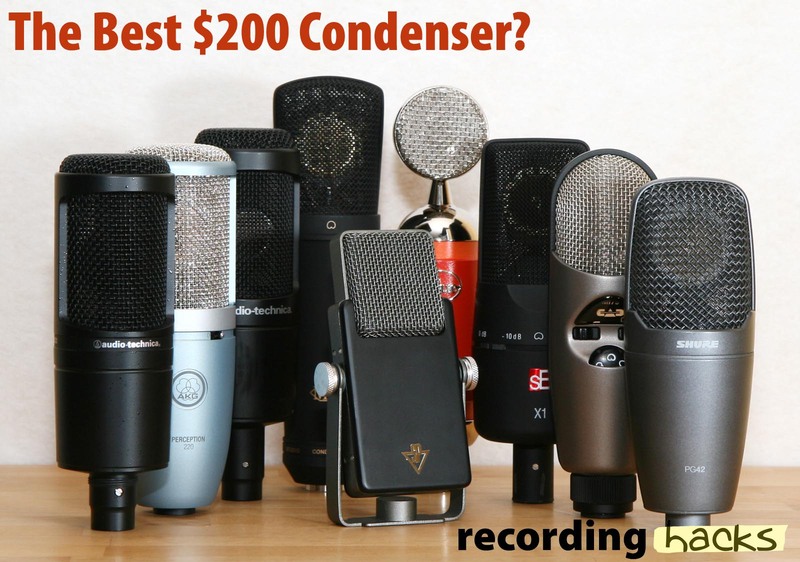 We recently surveyed seven entry-level condenser mics on vocals, acoustic guitar, and electric guitar cab, in part I of The Best $200 Condenser. Here in Part II, we’ll hear these mics — and a couple more — in a podcasting test. 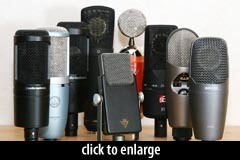 Strongly held biases (plus over 50 years of broadcast history) require the following disclaimer: if you are shopping for a dedicated voice/podcasting microphone, I encourage you to visit The Ultimate Podcasting Mic Shootout, which features numerous mics that I feel are better suited to podcasting than any of the inexpensive condensers listed below. Even better, see the more recent (November, 2012) shopper’s guide, RecordingHacks Editors’ Choice: Podcasting Gear. However, if you’re shopping for a multi-purpose “studio workhorse” microphone, which would be tasked for everything from podcasting and voiceover to instruments and sung vocals, then by all means please read on for a blind listening test of nine top-selling condenser mics. The CAD Audio M179 is a remarkable bargain at its common street price of under $150. It has a -20dB pad, a high-pass filter, and a continuously-variable pattern selection switch. It ships in an oversized, padded plastic case with both a ring mount and a shockmount. It is the only multipattern mic in this test. The Audio-Technica AT2020 is the first-generation version of the AT2035; both are electret condensers, although the AT2020 has a smaller capsule. It is a no-frills mic, with a simple ring mount, no pad, no filter; nonetheless, some claim it is the best $99 microphone on the market, and proponents use it daily for vocals and acoustic guitar. I recorded these tracks individually. Each mic was set up within my RealTraps PVB to minimize room reflections. Any pads or filters on the mics were disengaged. The M179 was set to Cardioid. My working distance was 10 inches for all mics. I used a dual-layer nylon pop filter in all cases. The preamp for all tracks was channel 1 of my BLA-modded Digi 002 Rack, with the high-pass filter engaged. Gain was set to produce consistent RMS levels in Pro Tools during tracking; levels were later fine-tuned prior to output. The original 24-bit, 44.1 kHz WAV files were converted to 320kbps mono MP3 via lame. 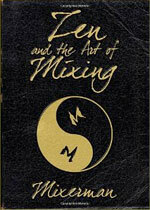 The audio sample is an excerpt from Mixerman’s awesome book, Zen and the Art of Mixing . (I strongly recommend this book; you’ll be hard-pressed to open to any page and not learn something.) I used the same excerpt in The Ultimate Podcasting Mic Shootout, facilitating comparisons to the best dynamic mics in the world. Every one of the condensers in this test picked up more clicky mouth noises than the dynamic mic. This is one of the reasons I tend to prefer dynamics for this application. Although a few tracks contain audible noise, none are noisy enough to cause problems. But this is potentially another problem with using condensers for podcasting — they’ll “hear” your computer fan, the HVAC, and your neighbor’s television. If you don’t have a relatively quiet space, your voice recordings will be better served by a dynamic mic. When monitoring these files over nearfields (mine are Mackie HR824s), the differences between the condenser tracks seem fairly subtle. Through headphones (Sennheiser HD650s), the differences are more apparent: the noise floor, the amount of room sound, the detail of the high frequencies, and the shape of the mids all come through. But let’s be clear about something: every voice is different, and every room is different. No matter which of these mics you prefer based on these audio samples, it is very unlikely you will ever be asked to record MY voice in MY room. This is a roundabout way of saying that however tempting it might be to listen to these clips and pick a “winner,” the utility of said mic in your room, on your voice, will remain to be seen. Therefore I encourage you to use these samples to come to some understanding of what each mic is doing, and then use that understanding to determine which mic might best fit your needs. 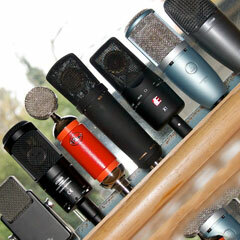 Then, too, you could certainly EQ any of these mics — and some of them, you’d definitely want to! 😉 For the purposes of this test, we are taking a purist approach, with unprocessed tracks. But it is a completely valid methodology to correct for source/mic mismatches via equalization. 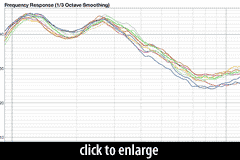 I imported all the audio clips into FuzzMeasure to produce an averaged frequency response chart for each. This helped me compare pairs of mics, and informed the specific frequency ranges given in the descriptions below. To other ears, say for example ears with attenuated sensitivity at 4–8kHz, these mics might be just the thing to deliver articulation and clarity. The same can be said of a voice — or any source — that is particularly dark and/or indistinct. The mics with the most happening in this frequency range were the Blue Spark (with or without Focus), Shure PG42, Audio-Technica AT2020, Studio Projects LSM. A handful of the microphones sounded pretty similar, and relatively neutral in tone. There are subtle variations in tonality, intimacy, and balance, but these mics generally all sound like me. Some of these mics sound colored. The CAD M179 is a good example; it has an almost exaggerated presence, with an interesting texture or graininess in the upper midrange. Maybe it’s just this presence that I’m hearing, but I feel like the response is scooped in the lower mids. It is not an unflattering sound at all, and I quite like the dryness of it, even if it sounds a bit thin. “Proximity effect” is the term used to describe the increase in low-frequency response that is characteristic of directional microphones as the mic is moved closer to the source. In short, standing closer to a Cardioid mic will make the voice sound bassier. If you think all the above tracks sounded thin, then you could certainly work the mics closer. I recorded a second set of tracks at a 5-inch distance. Every one of them produced a weightier, more intimate sound than at the 10-inch distance. And a lot of the mics sounded good this way. But every one of them popped, even though I was using a 2-layer nylon pop filter. Also, most every one of them recorded too much mouth noise. You’ll hear this in the samples below. Tonally, I liked several of the mics at this distance — in fact, I heard fewer tonal variations at this distance than at 10 inches (which serves to illustrate that subtle usage differences can result in significantly changed results, but of course you knew that already). EQ is not a crime! But again, were I were to use any of these mics at 5 inches, I would need to position them off-axis to avoid plosives. We’ve provided the 24-bit, 44.1 kHz WAV files for your dissection and analysis. These files have been gain-matched in Pro Tools. The files have been renamed to preserve their anonymity; a secret key that identifies each track is included. How you use the mic will determine your success! At 10 inches, the Blue Spark and Shure PG42 did not work for me at all. But at half that distance, both mics were much much nicer. In fact, as I worked all these mics closer, many of the tonal differences disappeared. The AT2035 is a great value as compared to its sibling, the AT2020: for about $80 more in cost, the AT2035 gives you higher sensitivity, lower self-noise, a shockmount, pad and filter, and a much nicer sound — at least for my voice. Aaron and I disagree about the MXL 2003A. I thought the mic worked well on my voice, and I had no problems with self-noise. The AKG Perception 220 was Aaron’s pick in Pt. I, and worked well on my voice at both 5 and 10 inches. The Studio Projects LSM was Aaron’s second pick, and a solid choice on my voice at 5 inches. The sE Electronics X1 was the strongest performer in my voice tests; I picked it as one of the best at both distances tested. 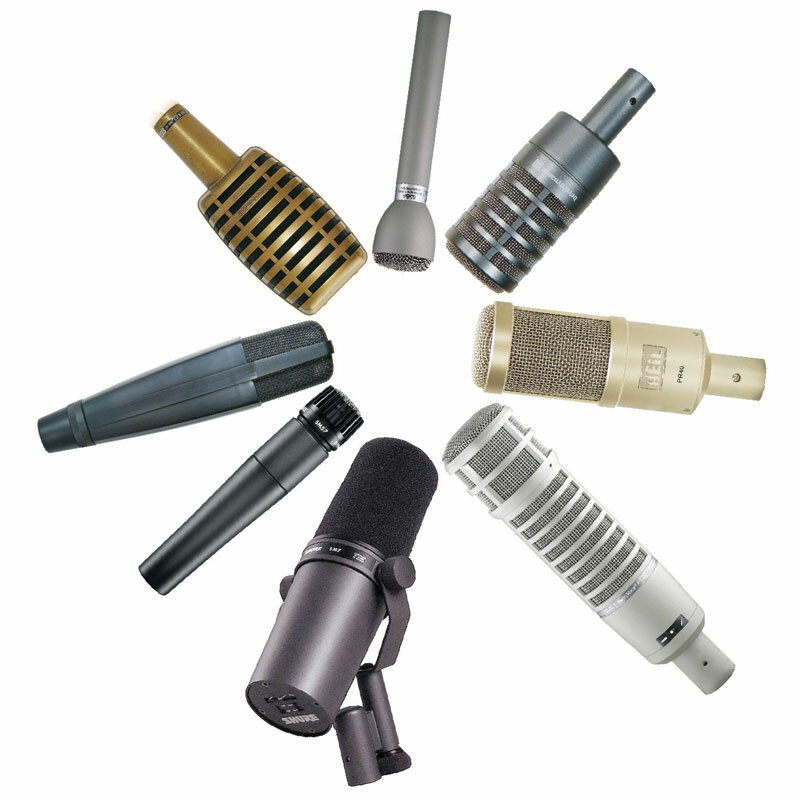 If you’re shopping, please remember that we maintain a list of the best online sale prices for every microphone; just see the profile pages in the mic database. Thank you so much, this would have saved me a bunch of time two years ago. I know it it will save people time today. Well done! I’m still quite fond of the Shure PG27 for a budget condenser. Of course, I frequently suffer serious mic envy! Ho, ho, ho! Thanks for all the hard work to present this. Thanks so much. Just for fun…I tried to recreate your tests with some of my mics in a very uncontrolled, unscientific way. The reason I did it is because I like to use my Rode NTG-2 shotgun for these types of things. I used the same audio sample that Matt uses. After listening to your tests, I actually ordered a CAD M179. Just “knowing” my voice, I felt this would be a good choice. I was wrong, it was a great choice. With the bass pad engaged at standard cardioid, it gives my voice a low mid sheen that I really like, and it’s low noise floor can not be beat. It may not work with everyone’s voice the same way, and as you mentioned a lot has to do with your mic technique, but the said coloring makes my voice “pop” on a voice over. You’ve provided a great service to those of us who record music for a living. Thanks! Perhaps at some point you could attach a freq analysis snapshot of the each example ?. Incredible test! Awesome reviews! I found your site after watching reviews on Youtube and seeing how the same microhpne would sound different depending on the person reviewing and the circumstances surrounding the test. (equipment, environment, mixer, amp etc). So, I sarted here. Then what happened. I was happy that I really didn’t care about the minor differences between all of the mics in such a small price range. That was until you stuck a $400.00 in the mix. Once I heard the EV RE20, it stood out like a sore thumb. So, I went to your ULTIMATE TEST page, and sure enough, that mic even won in the 3 to 400 range group. So basically, thanks for ending my search, and putting me out of my misery for my podcasting, I’m going with that mic! Done deal! Note the date on this comment. I just purchased an sEX1 to replace my AKG Perception 220. My choice was based solely on what sounded the best for my, and my wife’s, voice and the need for a mic that gave us the top end shine I want in our voiceovers for broadcast. The sEX1 seems to be aiming at a TLM103 sound at a fraction of the price. 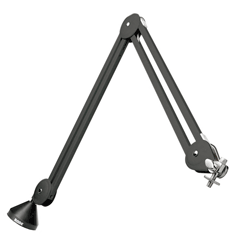 I recommend spending the $50 for the shock mount/pop filter accessory, even though that puts you over the $200 red line. The Perception 220 went silent after about 5 years of service. I’ve been informed that AKG no longer services this mic. That’s sad. I liked it. Hello, thanks for the tests! In the part where you have 2 recordings, one saying narration and the other, proximity, how far away were you from the mics to get the narration sound? I’m trying to figure out for myself how far away I should record for my own personal narrations so it sounds more natural. Thanks! I have a fairly quiet voice, with a bit more high-end than low end. It actually sounds a tad feminine, but I’m a guy. I also have a tendency to accidentally mumble, and I probably create a higher than average amount of plosives and sibilance. Looking for a cardioid condenser solid-state mic, I came across this article, but it doesn’t really end my search. Currently I like the Blue Spark the best, but which of these would be best for my voice? @Cory, only you can answer that question. Nobody else has your voice, and nobody else has your ears, nor your preferences for what you WANT to hear. And of course, no mic can fix mumbling, nor plosives. I would recommend a couple things: use the mic close, to benefit from proximity, but position the mic off-axis to combat plosives. Avoid typical cheap condensers as they’re both bright and thin, which is the reverse of what you need. Try a ribbon mic, a couple moving-coil dynamics, and darker condensers. I took your blind test with Senn HD 598’s on; my amateur opinions below. I thought the RE-20 sounded best, although the high noise floor turned me off from it. Noise can be removed in post though and the RE-20 has some other nice perks; ie: dynamic / limited proximity effect. It sounded a lot like a SM7B to me actually. The SE Electronics X1 seemed balanced in tone/clarity, with only a slight noise floor and only a mildly hollow/cheap sound to it. Perhaps I heard more of the room noise with this mic? With a more effeminate voice I could see this working great. The CAD-179 was very similar to the SE Electronics X1, but overall it had a slight bit more warmth, lower noise, and a slightly less hollow sound to it. I would probably go with this one for my own podcast among these budget condenser options. my notes from my blind test below, if anyone cares. Anyways, great test — still useful to people years later! 6. same as 5. tad noisy? 7. noise. slightly cheap sound, but good tone/clarity otherwise. 9. very rich, but also very noisy. Lots more presence than the others; reminds me of an SM7B. 10. slight noise. see 2.